The outside of the lungs and the inside of the chest cavity are lined by a continuous membrane called the pleura (see illustration). The portion of the pleura surrounding the lungs is called the visceral pleura, while the portion along the chest wall is called the parietal pleura. The pleural space is moistened with a small amount of fluid that allows the two sides of the lining to slide against each other easily during each breath. In a healthy person the two pleural surfaces are adjacent to each other and there is little space between the two pleural membranes. 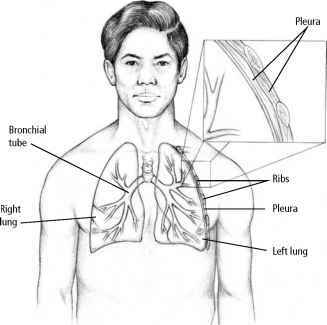 The pleura is a thin membrane with two layers that cover the lungs and chest cavity. Fluid between the two layers provides lubrication and allows smooth expansion and contraction of the lungs during breathing. Concerns agent that enters the pleural space, injury (such as a rib fracture), and exposure to asbestos fibers. The pleura become swollen, and their surfaces may stick together rather than move freely when the person breathes. This causes chest pain that is aggravated by a deep breath or a cough. The pain may extend to the neck, shoulders, or abdomen on the affected side. Efforts to minimize the pain often lead to rapid, shallow breathing. Because pleurisy is a symptom and not a disease or disorder, the only way to eliminate it is to treat the underlying cause. In the meantime, your doctor probably will recommend that you take a nonprescription painkiller such as aspirin, ibuprofen, or acetaminophen. Also, you might be more comfortable if you wrap your chest with elastic cloth bandages, or if you clutch a pillow to the affected side to minimize chest wall motion during breathing. Heart failure, cancer, pulmonary embolism, infection, and inflammation can cause fluid to accumulate in the pleural space. The presence of any excess fluid in the pleural space is known as pleural effusion. Fluid can accumulate due to changes in pressure in the lymphatic or blood circulation of the pleural space, or to changes in the permeability of the pleural membranes. If blood accumulates in the pleural space, the condition is known as hemothorax. If pus is involved, the condition is called empyema. Sometimes a pleural effusion is discovered by chance on a chest X ray that was taken for another purpose. Common symptoms include chest pain and shortness of breath. Identifying the cause of and determining the appropriate treatment for pleural effusion require removing and examining some of the fluid using a procedure called thoracentesis (see "Diagnostic Procedures," page 256). A biopsy (removal of a small sample of tissue for examination under a microscope) of the pleural membranes also may be performed. To help the person's breathing and relieve the discomfort associated with pleural effusion, and to help make a diagnosis, some or all of the fluid is drained with a needle or a tube. 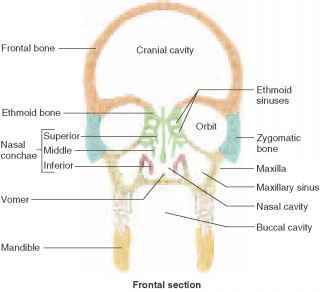 Treatment depends on the underlying cause of the fluid buildup. Pneumothorax refers to the accumulation of air in the pleural space. It can result from a penetrating injury such as a rib fracture, or from diseases—such as emphysema, asthma, tuberculosis, or cystic fibrosis—that cause an air leak from the lung into the pleural space. Spontaneous pneumothorax can occur for no apparent reason in tall men younger than 40 and among people who scuba dive or engage in high-altitude activities such as mountain climbing. Your doctor can diagnose pneumothorax based on changes in breath sounds, as detected with a stethoscope, and with a chest X ray. A small, spontaneous pneumothorax will usually clear up on its own in a few days as the air is absorbed into surrounding tissues. In emergency situations the air may need to be drawn out with a needle or a tube inserted into the chest cavity to relieve pressure. With a larger or recurrent pneumothorax, surgical repair may be required.